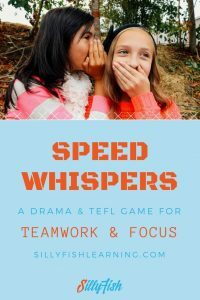 Speed Whispers helps focus children while they’re working in a team and can create a great sense of camaraderie. It also has the added bonus of improving diction and is an incredibly effective TEFL/TESOL game. Use this game for vocal practice or as a cooldown. Divide the students into two equal teams. Sit the teams in parallel lines facing the teacher. The last member of each team should have their back to the wall furthest away from the teacher. the first member of each team comes forward to the teacher who whispers the same phrase or sentence to each child. On cue, these two students must whisper the phrase to the next person in the line. The phrase is passed down the line until it reaches the person at the back. No member of the line can be skipped and only the person directly ahead of them can pass on the message. The final member of the team must run to the teacher and whisper the phrase. The team who reaches the teacher first receives one point. The team who repeat the phrase most accurately get two points (accuracy is more important than speed). Make a note of the score and then continue. The person who has just run to whisper to the teacher remains at the front to receive the next phrase. All other students must shuffle back. The final person must have their back to the wall to ensure both teams have an equal distance to reach the teacher. Continue until all teams members have started and finished the line. Top tip: Give a theme to all phrases e.g. lines from Shakespeare plays and give 10 bonus points to whichever team can reach you first with the correct answer. Drama Team Game – Bing, Bang, Bong!